To start, try a bucket that holds around 10L. You will need some sort of lid. If the bucket is plastic, drill 1/2″ holes around the bucket. Approx 12 holes around the outside, and about 3 holes on the bottom. Tape the holes with masking tape (from the outside). You will remove the tape later. You can use other materials. 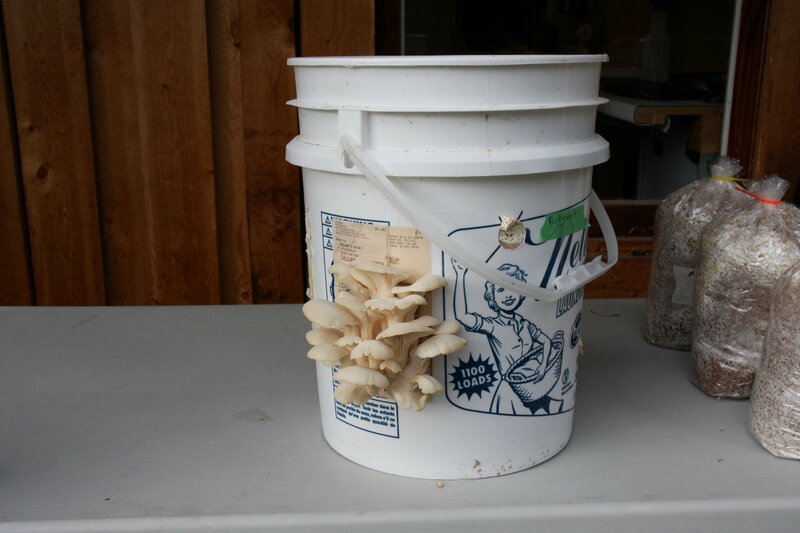 If you cannot drill holes in the bucket, then you will be encouraging mushrooms to fruit out the top instead. We suggest starting with a smaller bucket at it will give you a higher chance of success. Once you figure out how fast the bucket colonizes, then you can move to different sized! You can purchase them at Canadian Tire. Ensure you purchase HARDWOOD pellets! This is your base substrate. Once you have your materials ready, you need to hydrate them. Once you have chosen your substrate mix, you need to hydrate it. First, find a container large enough to mix your substrate in (at least as large as the bucket you are going to use.) Clean the container with bleach or another disinfectant. Then, mix your substrate in the bucket. Add water. Be patient, wood pellet take a while to hydrate if you are using cold water. We recommend using hot water. You want a substrate that is moist but NOT wet. When you squeeze it in your hands, only one or two drops of water should come out. If a stream of water is coming out, then add more hardwood pellets or another substrate that is dry. When the substrate is too wet, the mycelium drown in an anaerobic environment. Prepare your bucket (or container) by cleaning it with a disinfectant such as bleach. If you are going to use scissors or a knife to cut the cardboard, disinfect those tools. Wash your hands very well. Wear clean clothes or a clean apron. Work in a clean environment. Add some of your substrate to the bottom of the bucket. About 5 cm. Create a single layer of cardboard. You can use a flat layer (i.e. one piece cut to size) or cut up the cardboard into smaller pieces. Do not layer cardboard pieces on top of each other. Getting cardboard to the outside edge of the bucket is more important than the middle. Add some of your substrate on top of the cardboard. About 5cm. Create another layer of cardboard. Repeat. Ensure the last layer is substrate. Cover the top with a loosely fitting cover. Place the bucket in a dark (optional) area with a temperature of at least 15°C. Do not place the bucket in a drafty area – the moisture loss will be too great. Each day, check for mold. If there is mold on top, you can attempt to remove the mold (with a clean tool). If there are large amounts of mold, add the contents of the bucket to the compost bin. Better luck next time! Each day, check for moisture. If the substrate is drying out, spray the top with water. It’s best, if you are using city water, to let the water stand for a few hours before using it. This allows the chlorine to evaporate. To check how far along the substrate has colonized, peal back some of the masking tape and look! Once the bucket is colonized, remove the tape from the holes. You can optionally remove the lid. If you do, ensure you consistently mist with water to keep the moisture/humidity level up. Mushrooms will fruit from the holes! Harvest the mushrooms before they start to sporulate. You can tell they are about to drop spores when the edges of the mushrooms start to curl upwards. You will also notice they start to dry out.